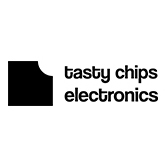 The Tasty Chips GR-1 is a Polyphonic Granular Synthesizer which allows you to import an audio file, scan through it and play that particular slice of audio, polyphonically. The GR-1 is built around a Raspberry PI and it features super high quality 800 x 480 pixel, 7” TFT true color display, which makes editing, tweaking and morphing your sound a pleasure. It's form of synthesis lends itself particularly well to soundscapes, pads, drones and textures, though it is perfectly at home making glitches, percussive tones and bass sounds. As mentioned before, the GR-1 runs on a custom Raspberry PI, which makes for very smooth and effortless workflow and makes the UI incredibly responsive and lag free. GR1 provides 16 voice of full polyphony, with a maximum of 128 grain per voice, meaning very dense and complex timbres can be generated with ease. Loading samples is really easy and fast, either take them from the onboard memory or from a USB hard drive, which can be directly connected to the synth.